Whoopee! show your newsletter for freebies! Calling all Shu Uemura Fanatiks! (also known as members). 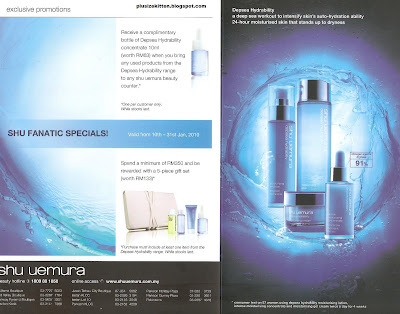 Check your mail box coz the latest Shu Uemura Newsletter is out and this time featuring their revamp Deepsea range called the Deepsea Hydrability which is the first tri-action moisturizing programme from Shu Uemura! 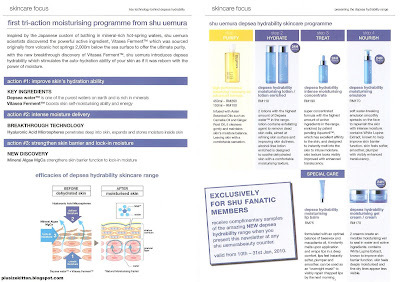 Using your newsletter you can redeem free samples from Shu Uemura. For those who are Citibank Member! you can also show your credit card to Shu Uemura Parkson and redeem samples muahahhahaha and there's a special promotion too for Citibank Member. For those who's not a member or holding Citibank card, don't worry I'm sure if you ask nicely, you'll get to try some samples too. After all sampling is a way of getting customers (new or old) to fall in love with your products. Once they're hooked, there's no saying what they'll do! Tomorrow I go Pavilion ask again..
ya :( they're re-ordering now.. 2nd batch to give out..
hahah... I got citibank visa debit. not credit card, but should work? Hehe.